Go to the left side menu and choose (1) Plugins > (2) Plugin Manager. (3) Click install and the plugin should be installed. Perform a system check in Sobi and correct any errors. 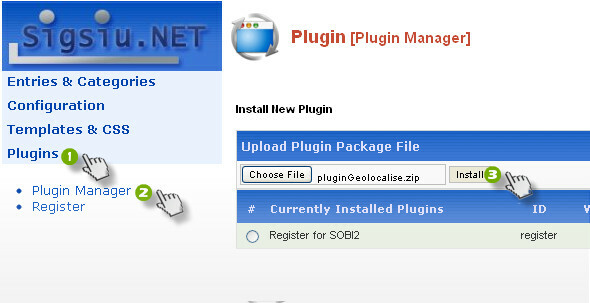 Once installation is complete, In SOBI Pluginns, select Geolocalise, go to "Version & registration" tab of your plugin and enter the registration number (for exemple: 123456789) which we mentioned above. Click save. Your plugin is now registered. In "Version & registration" line you will now see a message in green indicating that the registration is correct (Your product is registred. Thank you.) and that the version is updated. Note: Your version may be newer than the server, because we do not publish necessarily minor update.